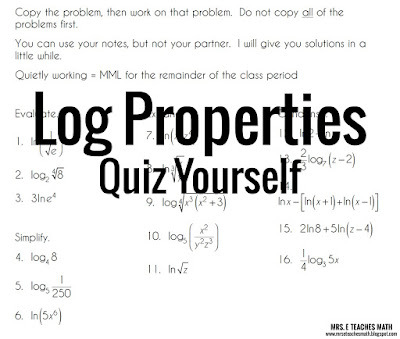 So, I always loved teaching logs in Algebra 2. I have so many fun things that I did during that unit! This isn’t really an activity, but it always worked well with my kids. 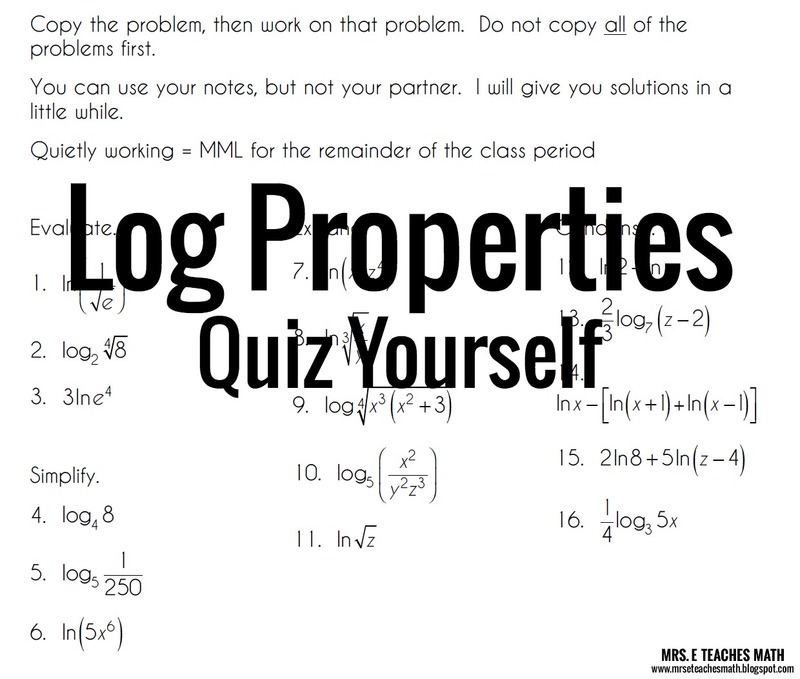 I made this “quiz” for my students with everything I wanted them to know after the expanding and condensing logs lesson. I usually put it under the document camera and told them it was a pop quiz (which it really wasn’t). Then, I set a timer for 10 or 15 minutes. I didn’t allow them to use their notes. They always freaked out a little in the beginning, then read the instructions and calmed down a little. Once the timer went off, we would check our answers together. Giving a fake quiz always inspired my students to start studying (go figure!). After I did this the first time, I started doing it more often. It scares the kids that haven’t been doing their homework, but doesn’t necessarily penalize them. I like doing this because students often decide on their own to review their notes, rather than having me nag them, which is always a win. Thank you for this post! Curious... what is MML? Dawn, MML is My Math Lab. :) My students had their homework on the computer. I like this idea. What a great way to hold students accountable!